After searching everywhere for help purchasing a new power chair, a disabled veteran discovers Alternatives in Motion - a nonprofit with the chair he needs. Tony, a 74-year-old veteran with constant pain and a run-down power chair, needed financial help purchasing a new chair, a cost of over $10,000, but everyone he asked turned him down. Then, he found Alternatives in Motion. The only problem? He lives in Okemah, Oklahoma, more than 1,000 miles away from Grand Rapids. When 74-year-old veteran Tony’s power wheelchair wore down and hindered his freedom, he searched everywhere for help covering the $10,000 price of a new one. After exhausting all options from insurance to local services, he discovered Alternatives in Motion, a nonprofit providing donated mobility equipment to those in financial need. The only problem: Alternatives in Motion is in Grand Rapids, Mich., over 1,000 miles away from his home at an assisted living facility in Okemah, Oklahoma. For 40 years, Tony played piano on the Las Vegas strip every night. Now, he suffers from conditions which leave him in constant pain and make it impossible for him to lift his arms or stand on his right leg. This means he can’t use a manual wheelchair and must rely on the battery life of a power chair for independence. His quest for a better option led him to the West Michigan nonprofit. “I was searching for anything I could find after being rejected so broadly,” he said. Despite Tony’s distance, Coleen Davis, Executive Director, decided to help when she realized someone had donated the exact power chair he needed. The last hurdle became the shipping price. Realizing Toyota had labeled May “Mobility Awareness Month,” Davis called the Jim Norton Toyota in Tulsa, Oklahoma, and explained the situation, asking if they would pay the shipping. They gladly obliged. 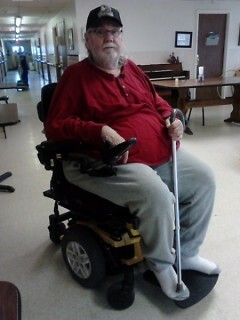 With his new, donated chair, Tony can once again enjoy the independence and quality of life brought by having the ability to move around on his own. He is excited to use it not only to roam his place of residence, but to escape and visit the post office and library. “I’ll be forever grateful for them for doing that, otherwise I would just sit here and look at the wall,” he said. Tony’s story has a happy ending. But, with the lack of widespread resources like those offered at Alternatives in Motion, many people in similar situations are left with no chair, no freedom, and nowhere to turn.